Hugh Benjamin Haslam was the son of Edmund Bury and Margaret Haslam. He was born and lived in Sherrygroom, Stewartstown on 16th July 1890. He was one of at least six children. Hugh Haslam and Georgina Gallagher were married on 11th November 1915 in Belfast. Hugh Haslam enlisted in Clydebank, Scotland. 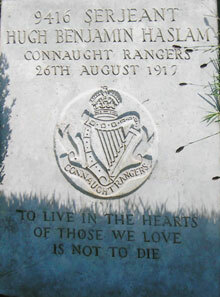 He served with the 6th Battalion of the Connaught Rangers. 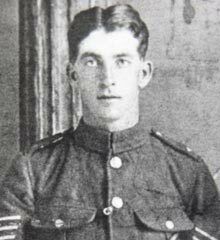 He was severely wounded and died from his wounds on Sunday 26th August 1917. In his will he left all to his wife Georgina, who was living at 18 St Vincent Street, Belfast. Boulogne-sur-Mer is a large Channel port. Boulogne Eastern Cemetery, one of the town cemeteries, lies in the district of St Martin Boulogne, just beyond the eastern (Chateau) corner of the Citadel (Haute-Ville). The cemetery is a large civil cemetery, split in two by the Rue de Dringhen, just south of the main road (RN42) to St Omer. The Commonwealth War Graves plot is located down the western edge of the southern section of the cemetery, with an entrance in the Rue de Dringhen. Car parking is available along the Rue de Dringhen.